NAMM: Moog Music moogerfooger FreqBox Meant to be Heard, Not Seen? 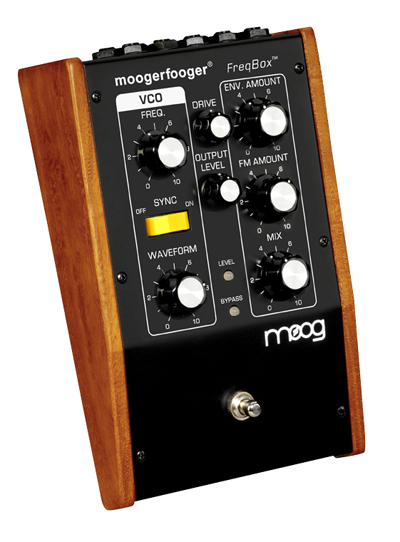 Apparently what we’re hearing is the upcoming moogerfooger FreqBox, which showed up Friday on the Moog forums. The FreqBox does not actually modify the audio input signal. Inside the FreqBox is a Voltage Controlled Oscillator (VCO) which is modulated by the sound source input—an Audio Modulated VCO! The result is an amazing array of effects that were once only possible with a complex modular synth setup—everything from fuzz-like distortion to what product development engineer Steve Dunnington calls “cataclysmic timbral morphing” A true “freak box”! Now we’re talking: a budget-priced, real analog oscillator you can modulate with audio. During a NAMM show when almost everything could be easily replaced (DSP-based synths with soft synths, cheezy new DJ solutions with turntables), this could be the box that pleases analog and computer lovers alike, just because there’s nothing else quite like it. Naturally, we’re anxious to get some additional details and pricing, so stay tuned.